Save up to 25% in the Nicols FLASH SALE! A new barge for 2019! Read on for a taste of the south and details of how you can save up to 20% on self-drive cruises, and up to 8000 USD on hotel barge cruises! Picture shot by Jean-Pierre Lavoie (c), 2005. The UNESCO listed Medieval citadel is the largest preserved chateau of it’s period. Perched above the Canal du Midi, it was completely restored in 1843. The concentric design of the town within the two walls and 52 turrets, some of which date back to Roman times, invites you to step back to the middle ages, and to view the valley below. Children will love the drawbridge, moat and keep, and of course, the Musee de Torture. Amid the cobbled and paved streets you will find numerous restaurants, bistros, boutiques and galleries to explore. Throughout July, Carcassonne holds a festival in the Ampitheater of the Castle with nightly shows including dance, music and theater. If here on the 13th to 14th July, you will see one of the best firework displays imaginable! So much more than the golden sands and 300 days of sunshine each year, Narbonne was once the largest city in Roman Gaul. The various museums and art galleries trace the history of the town and are ideally situated in the center. Visit The Archbishops Palace, which has been described as Gothic Architecture at its best and the 13th century Cathedral St Just standing magnificently in the center of the town with their secret inner-gardens. For a fantastic view of the Pyrenees, climb the 162 steps of the Donjons.. it’s well worth the effort! Food-lovers should take time to visit Les Halles… the daily, indoor market is the place to savour and purchase fresh, local produce. Each Sunday, a colourful market along the banks of the canal sells a range of clothing, leather goods and shoes. Although a small fishing village, pilgrimages have visited Saint Marie de la Mer throughout the ages. According to local legend, following the Crucifixion, Lazarus and a group of pilgrims including Mary Magdalene arrived here having been forced out of Palestine. Mary Jacobe and Mary Salome founded a small church here and lived out a quiet existence, helped by a local servant gypsy named Sara. She is now the patron saint of all gypsies. The annual gypsy fair in late May attracts visitors from all over the world. Traditional music, inviting market stalls and fortune tellers all add to the mystique. Vincent Van Gogh captured the peace of the quiet streets and the seascapes here…and perhaps he too enjoyed the savoury fresh fish available on the restaurant terraces. Nature lovers will enjoy the Musee Baracelli, which is dedicated to the rich flora and fauna of the Camargue region. During his one year stay here with Paul Gauguin, in 1888-1889, Vincent Van Gogh produced more than 300 works, including some of his most famous. The town and southern light were surely inspirational. Visit the Espace Van Gogh, housed in the ancient hospital, for an insight to his work. Arles is now the home of the acclaimed national photography school, and hosts an annual photography festival, from mid July to Mid September, the Rencontres d’Arles. 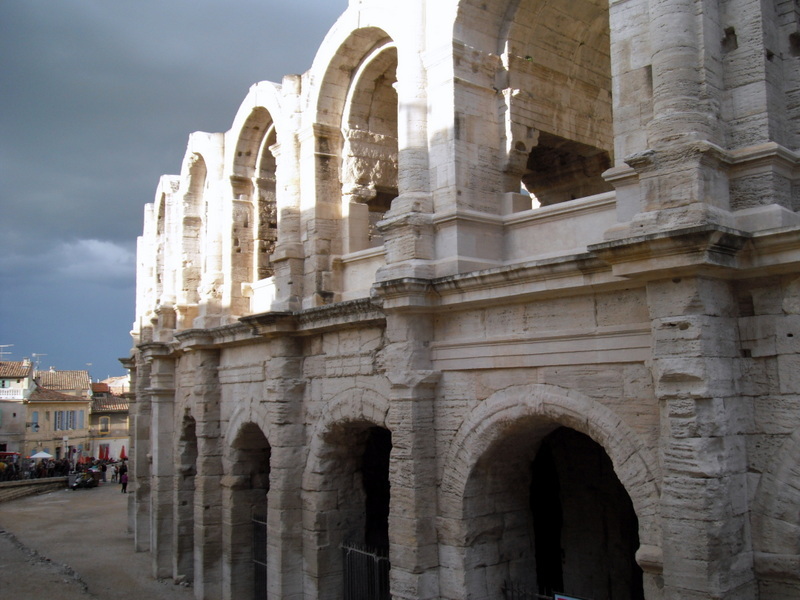 Listed as a UNESCO world heritage site, Arles has many examples of Romanesque architecture. See the Roman Theater, the Amphitheater, The Alyscamps, The Therms of Constantine, and the Church of St Trophime. The museum houses one of the largest exhibitions of Romanesque artefacts outside Rome itself. The modern museums capture the very essence of art and history. For fresh produce, the town has an excellent, colourful street market each Wednesday and Saturday. 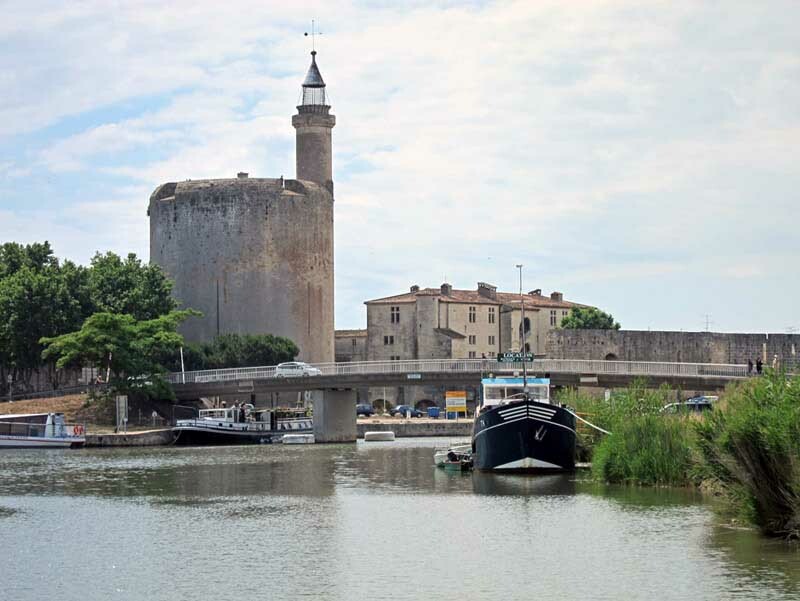 This medieval walled town is set among the dunes of the beautiful Camargue region. Founded in 1240 by St Louis, the town is built on a traditional grid layout and you can spend many a happy hour exploring this Crusader port. Visit the 40 meter high Towers of Constance , walk the 1650 meters-long ramparts, and admire the stunning stained glass windows in the Church of Notre Dames des Sablons. The region is a nature lovers paradise: See the salt works on which this town was founded, the wild bulls and Camargue horses, flamingoes and oyster beds. After your sightseeing, enjoy the local delicacy Fougasse, a traditional sweet pastry with a hint of orange blossom. The Fete de St Louis is held in late August each year…This medieval pageant includes a reenactment of St Louis’ departure for the Crusades. We offer both traditional style boats and modern cruisers for self-drive holidays in the south with boats to suit from 2 to 12. You can even hire a skipper and/or hostess to accompany you should you wish! With current discounts of up to 20% throughout the season, now is the perfect time to book your next sunshine cruise. Alternatively, why not cruise aboard a luxury hotel barge for a truly relaxing break? Either join like-minded travellers or charter a floating hotel to enjoy excellent guided excursions, private wine tastings and fine dining. The Anjodi and Enchante for 8 guests, and the Clair de Lune for 6, are all beautifully appointed barges offering very comfortable accommodation and the added bonus of a spa on deck! Save up to 2500 USD per cabin on selected departure dates in June, July & August or up to 8000 USD off a charter when booking by June 20th. What a great way to celebrate the sunny weather! The Midi is the number one destination in France so early booking is highly recommended. Reply to this newsletter for our freebies!